The Town of Chatham has served as the seat of Pittsylvania County since 1777, and as the commercial center for the surrounding rural region of tobacco-rich Southside, Virginia. Chatham's history runs deep. Pittsylvania County was formed in 1767, preceding the American Revolution. At the time, the colonies had been thrown into turmoil over King George III's Stamp Tax. Fortunately, the colonies did have a champion. William Pitt, the Earl of Chatham and a member of the English Parliament, had shown that he was a friend of the colonies by denouncing the Stamp Act. He stood before Parliament and argued that the English had no right to levy an unjust tax burden on the colonies. Referring to the Boston Tea Party he exclaimed, "I rejoice, the Americans have resisted." Pitt's stand resulted in the repeal of the Stamp Act in 1776. The next year, Pittsylvania County was separated from Halifax County, and the county's boundaries have remained the same since that time. Pittsylvania currently holds the title as Virginia's largest county. The name Pittsylvania, which means "beautiful woodland" was a token of grateful recognition to William Pitt for his sympathy to the colonies. The county's seat was originally located in the Callands community. In 1777, however, the county seat was moved from Callands to the county center, the town now called Chatham. 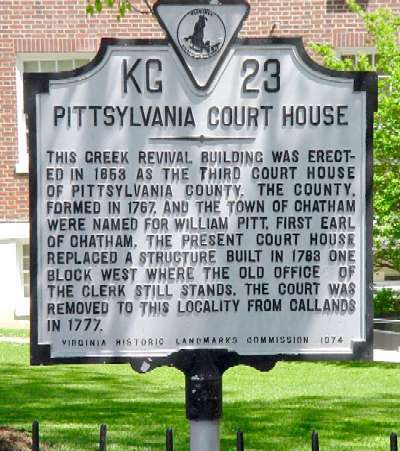 But at the time, the new county seat was known as Pittsylvania County Courthouse. The original courthouse was located where Chatham's Town Hall now stands at 16 Court Street. In 1806, the controversy over where to build a new courthouse resulted in the General Assembly confirming a new location and establishing the Town of Competition. A name change from Competition to Chatham was made by an act of the General Assembly, passed on May 1, 1852, and the town of Chatham was incorporated on April 24, 1874. The boundaries were then extended by one-quarter of a mile in all directions from the courthouse to encompass a total of one and one-half square miles. In 1882, the General Assembly again extended the boundaries to include the railroad west of Chatham. In 1894, Chatham Hall, a preparatory school for girls was established just east of town, and the Chatham Training School, now known as Hargrave Military Academy, was established in 1909 to the west. The two schools provided education as well as employment to many of the residents of Chatham. They have continued to the present day as integral parts of the town community. Chatham has remained relatively unchanged since the end of World War II. The population is approximately 1,350, and the town's boundaries encompass approximately two square miles. Chatham continues to serve as the governmental center for the rural region surrounding it. In October 2001, the Town of Chatham was placed on the Virginia Landmarks Register and the National Register of Historical Places. For more information about the 155 structures within the Historic District, see the Historic District info section. That section provides information about the Survey of Architectural Resources of Chatham, Virginia commissioned in preparation for the nomination of Chatham to the Virginia Landmarks Register and the National Register of Historical Places.